Last year on your birthday, I remember that I was in Kuantan busy writing and trying to solve the mysterious disappearance of our Malaysian plane MH370 and even felt your spirit as shared in our family post here. Coincidentally on both occasions when the photos were taken, I was fasting. In Kuantan was a special fast I made for the MH370 passengers and now it is the first Sunday of the month which is our regular fast Sunday for Church which is also happens to be Easter Sunday. It is just past midnight of your birthday on Malaysian time but still within US time where Fei and Su are. I guess I write best when I am settled in at home when all is quiet outside while the day is filled with having to run about following up on something or other during working hours. 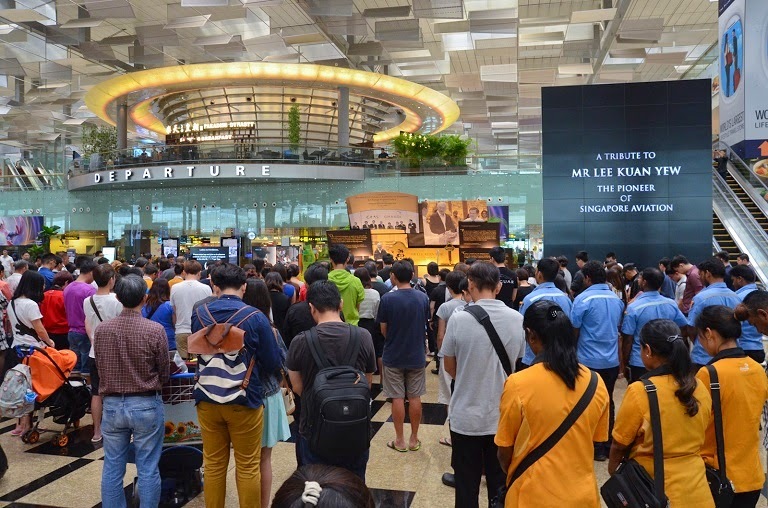 Here I am at peace to write to you after returning from a trip to Penang when news came in that Lee Kuan Yew had passed away on a Monday morning of 23 March 2015. 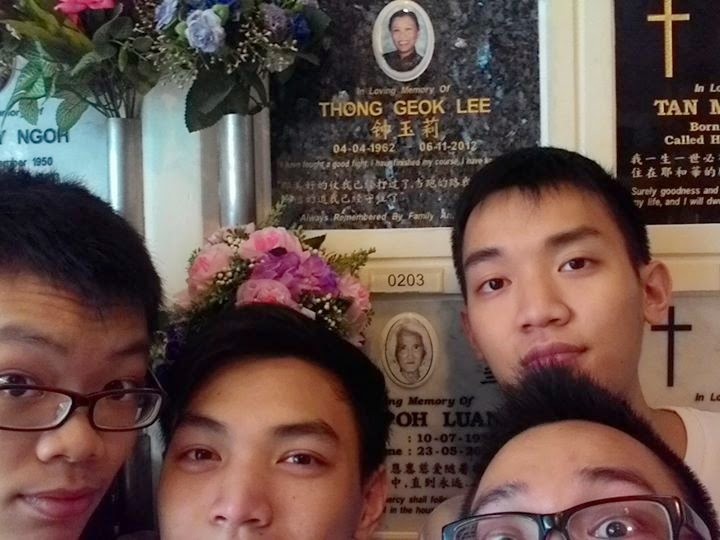 As you can see from this recent post, I had already started thinking and writing about his life and leadership in Singapore! 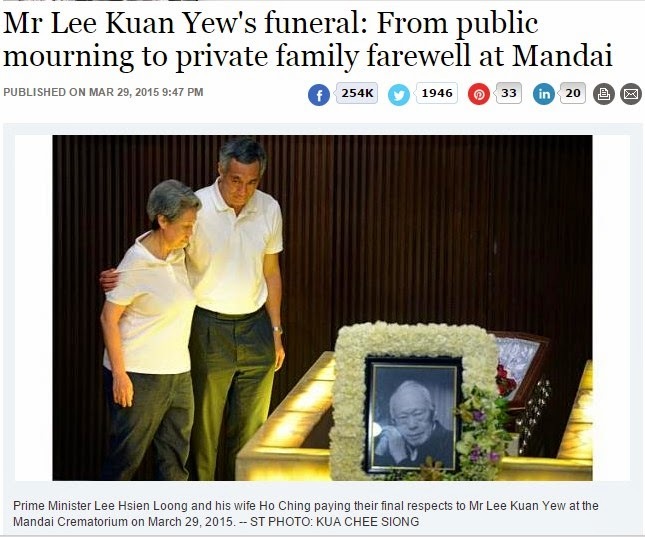 It was way before your birthday but I had already started connecting to you due to the passing of LKY as he is widely referred to, as all other names of highways or departments in Singapore, i.e. efficiently using 3 letter acronyms! ...while this photo is used in our Christmas family post the year you left us. This photo at Mandai crematorium is found on this news post. 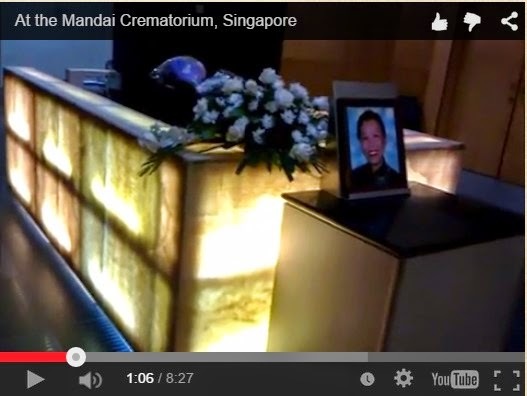 This photo is a screen shot of a video filmed at Mandai crematorium as found in this family post. Here I am fasting and feeling spiritual as I compose this letter with my Heart and Mind wondering if you will have the opportunity to meet Mr Lee Kuan Yew yourself over the other side of the veil? I like to share another coincidence in ending this letter. If you look at the photo of my desk above, there is a book on the shelf that belongs to you entitled, "The Singapore Story - Memoirs of LEE KUAN YEW". I had picked the book up to put in there to set the theme of my letter to you that relates to LKY and you. As I started writing, a thought came to my mind that I did have another book of LKY that was given to me by a friend in Singapore and looked for it from another shelf and found it quickly. Here is the music he composed for your 50th birthday with the video he created. I read his letter again and watched the video to find myself with no more words but tears in my eyes. We showed you a short clip of our performance of Side By Side at Yale-NUS Open Day 2015 previously. Now here's a full video courtesy of Sau Tsoi from Notes & Ties (another acapella group here at Yale-NUS! )Come catch us sing this song and more, alongside other singing groups under the Yale-NUS Singer's Guild, tomorrow night at the annual Spring Sing!When: 17th March 2015, 8.30pmWhere: SR1+2Tickets are on sale at $2 in the RC4 Dining Hall today and tomorrow at Lunch and Dinner times!Scheduling Club, The Gospel Choir and Notes & Ties are performing too! We promise a vocal treat, SO GET YOUR TICKETS NOW! About a couple of weeks later I felt the inspiration to look for this oldie in youtube and found it. It was one of the old film strips with sound that brought tears to my eyes each time I shared it as a young missionary and watching it again over 30 years as a video later brought tears to my eyes even before the narration of the story began towards the end of this video! No wonder I was touched to take amazing photos of rainbows in Utah as above. The film strip memory must have only remained in my subconscious mind all these years when I took those photos and just came into my conscious memory when I started searching for the youtube video above! 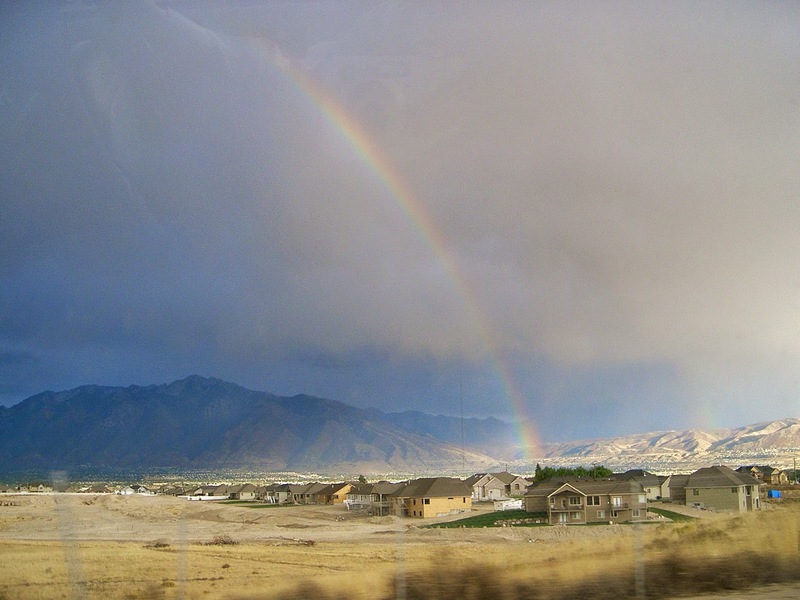 Even more double rainbows seen with Su when we took a trip from Provo to Moab Utah. Can't imagine that while I just enjoyed watching those film strip days of old and later movie films and videos that I could years later end up making my own. Above is one in memory of Mom who is certainly proud of her children before and even after she left us.